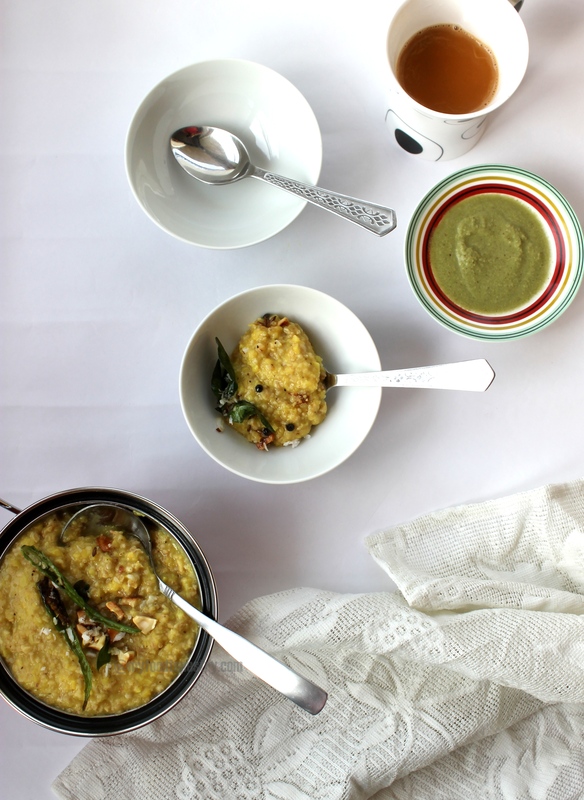 So while you’re still on that rickety I-will-follow-all-my-resolutions ride, try this wonderful totally healthier version of the humble rice pongal made with oats and moong dal. Oooh so warm and comforting to hold a bowl full of this on a nice cold winter morning. 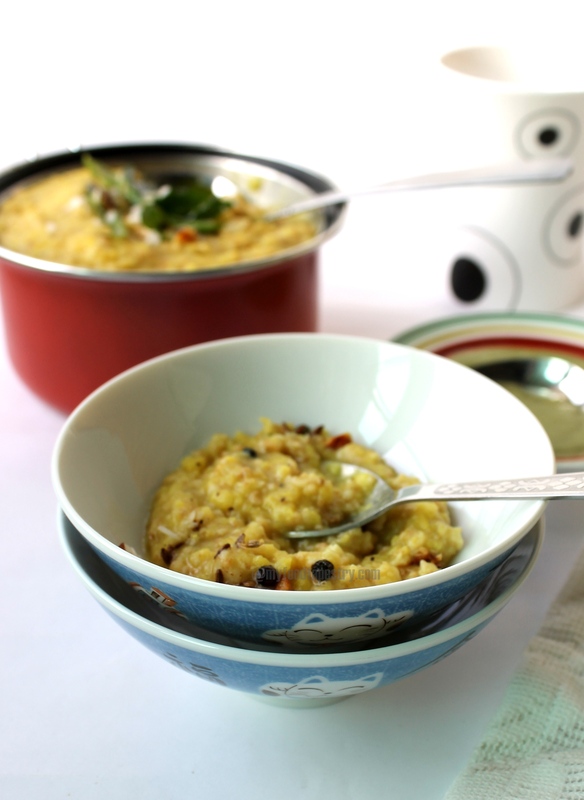 Pongal is a warm mushy South Indian rice dish, seasoned with black peppercorns, cumin and a bit of asafoetida. This version, skips the rice and substitutes it with oats. So those who have given the rice a miss, this meal is tasty, filling and totally guilt free! Wash and soak moong dal for an hour or so. If you don’t have time to soak, use as it is. In a wide pan, dry roast the oats for 4 minutes. Once done, remove and keep aside. Remove all the water from the dal, in the same pan, roast the soaked moong dal for a couple of minutes. Now, in a heavy bottomed sauce pan, boil the dal with 3 cups of water, season with turmeric and salt. Cook till mushy. At this stage add oats along with 1 cup water. 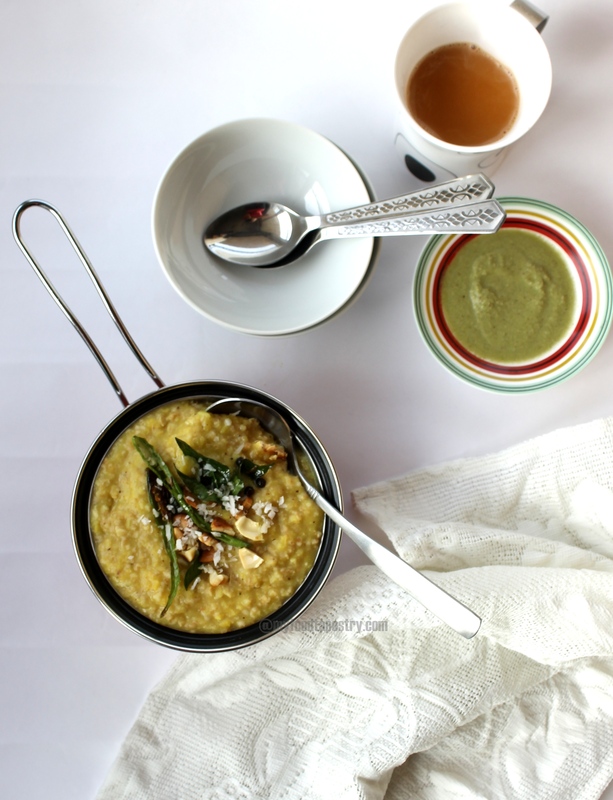 Cook till the oats and moong dal mix and come together. Add more water as per your desired consistency. Give it a boil or two and switch of the flame and keep the pan covered. For the tempering, heat ghee, roast cashews till they turn golden. Keep aside. Then crackle cumin, add asafoetida, add curry leaves, green chilies, pepper corns. Saute for a minute. Pour this tempering on the pongal. Garnish with chopped coriander leaves and grated coconut. Serve with curd or green chutney or raita. Note: Oats absorb a lot of water and tend to thicken quickly. For soft mushy pongal, add water in intervals and check for consistency. Note: Feel free to add chopped vegetables like spinach, peas, carrot. 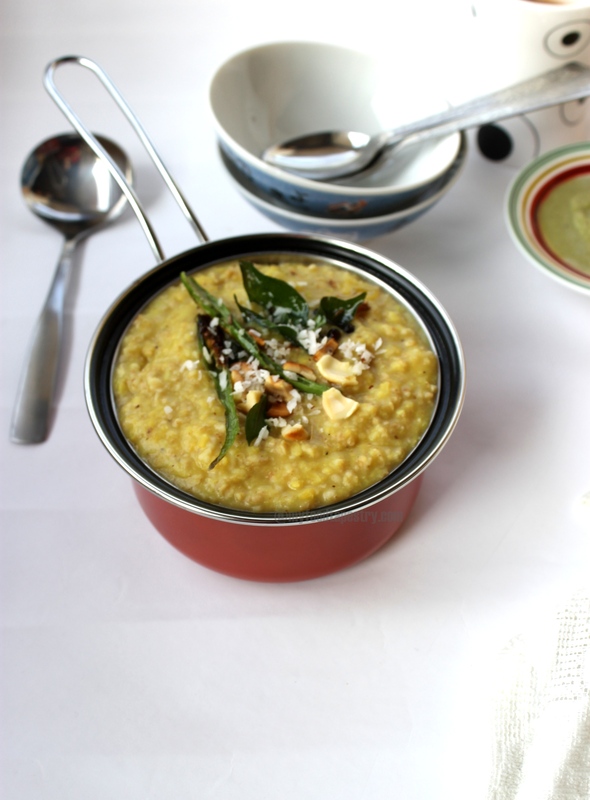 You can add the vegetables after cooking the moong dal and before throwing in the oats. Looks yummy! And so healthy too! Love this pongal version. It should cook faster than the traditional rice pongal, right? I cannot stand oatmeal porridge too. Yuck! So I bake it in cookies and convince myself I just made dessert healthy! Here’s to keeping all your resolutions. Have a good one!! Nicely done and lovely photos! 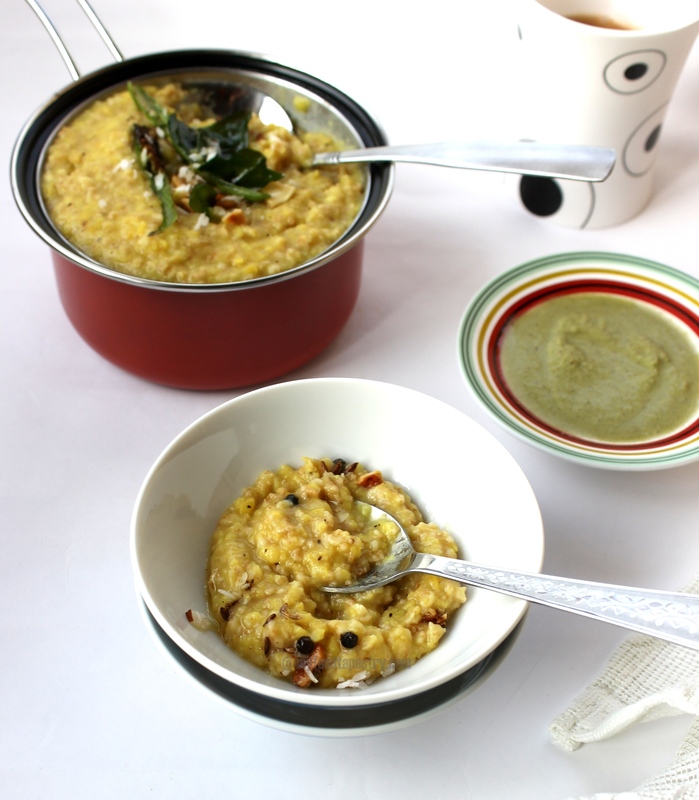 The stickiness of oats always make me cringe but pongal is one recipe where it is welcome! This is such a pleasant variation worth a try!